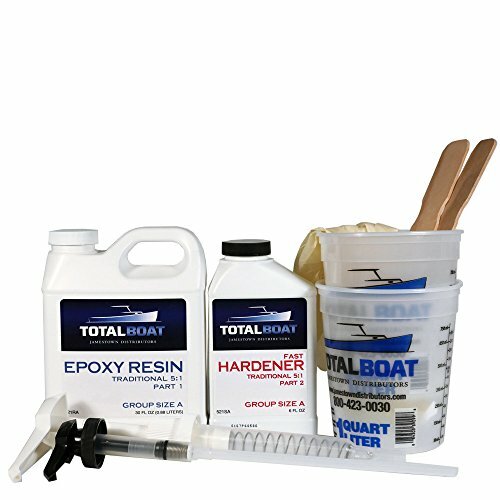 TotalBoat 5:1 Epoxy Kits contain the traditional 5:1 marine epoxy resin and hardener valued for its high strength and moisture resistance perfect for completing a variety of boat building projects and boat repairs, whether for wood or fiberglass boats. Kits contain TotalBoat traditional 5:1 Epoxy Resin (compare to West System 105), your choice of TotalBoat 5:1 Fast or Slow Hardener (compare to West System 205 and 206 hardeners), and calibrated 5:1 measuring pumps. The 5:1 epoxy resin and hardener pumps are designed to reduce waste in addition to ensuring you get the exact ratio and a perfect cure every time. Choose TotalBoat 5:1 Fast Hardener to achieve a proper cure while working in cooler temperatures (50-85°F). At 75°F, pot life is 12 minutes. Slow Hardener is best when working in warmer temperatures (70-95 degrees), or if you want to extend working times and cure times. At 75°F, pot life is 20 minutes. For dispensing product via pumps, the recommended temperature is 60-70°F. TotalBoat 5:1 marine epoxy resin can be applied to fiberglass, reinforcement fabrics, wood, etched aluminum, and bare steel. To make a strong adhesive, filleting material, or fairing compound, combine the resin with TotalBoat fillers and thickening agents. Available in 3 sizes: quart, gallon, and 4-gallon kits. Quart kit includes 30 fl. oz. of epoxy and 6 fl. oz. of hardener. Gallon kit includes 127 fl. oz. of resin with 25 fl.oz. oz of hardener. 4-gallon kits include 4.5 gallons of epoxy and 1 gallon of hardener. Product can be applied by brush, roller, or syringe. It can also be poured and spread using a plastic resin spreader. 5:1 Epoxy Resin Kits can save you time and money on projects ranging from wet layups and laminating, to installing bulkheads. All TotalBoat products are developed by boaters, for boaters. We know what works and what doesn't. Pot life ranges from 12 minutes @ 75°F for Fast Hardener, to 20 minutes @ 75°F for Slow Hardener. Cures to a high-strength, moisture-resistant, light amber plastic solid that can be sanded and shaped easily, once cured. Not suitable for clear-coating applications. If you have any questions about this product by TotalBoat, contact us by completing and submitting the form below. If you are looking for a specif part number, please include it with your message.